Last Remnant is a Square Enix-developed RPG with a new and unique combat system that invites the gamers to an exciting experience. The Last Remnant is a role-playing game developed and published by Square Enix that debuted simultaneously worldwide on the Xbox 360 on November 20th, 2008, the PC on April 9th, 2009. There were plans to release a PlayStation 3 version, but it was never released. Directed by Hiroshi Takai ( Romancing Saga, The Bouncer), The Last Remnant is the first Square Enix title that utilizes Epic's Unreal Engine 3. 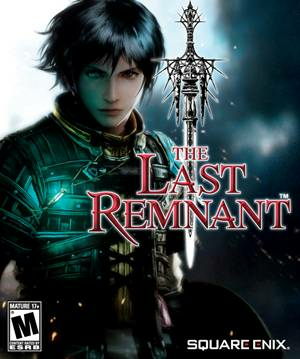 Developed specifically to appeal to both the Eastern and Western gaming markets -- featuring two very different characters with characteristics that appeal to gamers on both sides of the globe, the protagonist designed to appeal to Eastern consumers, one of his companions to Western -- The Last Remnant is the first Square Enix game to be simultaneously released in Japan, Europe and North America. The Last Remnant is set in a fictional world featuring a number of distinct humanoid races; the Mitra, most human in appearance, the Yama, strong fish-like people, the Qsiti, small reptilians, and the Sovanni, feline people with four arms and a rabbit-like creature (the name of this creature is currently unknown). The story of the game revolves around "remnants", mysterious and coveted ancient artifacts of varying shapes and sizes which possess magic powers and which have been the cause of several wars throughout the game's history. Rush Sykes is the protagonist of the story, the son of two established Remnant researchers whose sister Irina is kidnapped, sparking the story's initial plot development. He is supported by the Marquis of Athlum, David Nassau, and accompanied by four generals: Emma, Torgal, Blocter and Pagus. A mysterious man known as The Conqueror also figures prominently in the game's plot, a powerful warlord whose aggressive tendencies and surprising power over Remnants creates a shift in the balance of power within the governing Congress in Elysion. The Last Remnant is a strategy RPG in which the player must manage a party consisting of multiple units segmented into groups (called Unions). While following the central plot and/or completing quests, the player sets his/her Unions against AI Unions in battle. Navigation takes place via world and city map screens, with locations becoming available as the story progresses or as quests are accepted. Each city contains a Pub where quests can be found, and a Guild where Leaders can be recruited and Guild Tasks can be completed. Completion of quests often makes new Leaders become available at the Guilds. Unions are built around both story Leaders (i.e. Rush, David, etc), and Leaders found at Guilds. There is a limit to the number of Leaders that can be in a Union at any one time, so they are supplemented with recruit-able Athlumiam soldiers to make up the numbers. Unions are assigned a minimum of one Leader and up to four other units, as well as having a formation that affects the attributes of the Union. Party members other than Rush can not be directly customized. Their skill choices and equipment are handled directly by the game. The player can influence them indirectly though, as they must request items with which to improve their equipment and will often ask how they should focus their development in general terms as well as if they should bother with specific skill choices. Selecting a Union command during battle. The Last Remnant features a turn based strategy battle system termed by director Hiroshi Takai as a "Turn-burst, command-based system using symbol encounters." The system is a hybrid between a turn-based command system (i.e. Final Fantasy, Dragon Quest) and a turn-based strategy system. Unlike most other strategy RPGs it does not use a grid-based system. Battles begin when enemies that roam the field maps/dungeons either attack Rush or are drawn into battle with the Right Trigger, which pulls enemies from within a radius. The Right Bumper activates a Timeshift ability that slows down all time except for Rush's movement. While in Timeshift, the player can run around and tag enemies. Pressing the Right Trigger while still in Timeshift and having tagged some enemies pulls all of them into battle. Typically, the more enemies tagged, the harder the challenge but the greater the rewards. Unions share more than their AP, they also share HP. The HP of the member units are totaled to give the Union's HP. In order for the player to kill (referred to as Terminate) an enemy Union, or vice-versa, they must deplete its total HP. When Unions are engaged in combat, each unit will target another unit at random, either attacking or using its selected Art. Arts that target all units of a Union also exist. Individual units can be killed (referred to as Incapacitated) which has the effect of reducing the Unions capabilities. If the leader of a Union is Incapacitated then the Union is Botched, which causes it to stop receiving commands from the player. The damage dealt to a unit can exceed its maximum HP, resulting in an Overkill. Any extra damage beyond the limit of a single units HP counts towards the damage the Union receives. This means that attacking a single unit can result in Termination of the entire Union if the damage dealt is sufficient. During a battle multiple Unions, both player and enemy, are usually present. When selecting Union commands the player must first select a target Union. The enemy Unions will also select targets which are unknown to the player. Once all Unions have received a target and command the Unions each approach their target in order and engage them in a Deadlock. Depending on the order in which the Unions act, the players Unions may not engage their target Unions, and vice-versa. Attempts to engage the enemy can be Intercepted if another Union engages first. Deadlock - This is the standard Deadlock type. Occurs when Unions meet within melee range. Raidlock - Occurs when forcing a Union into Deadlock from a distance. Damage dealt is increased for the offensive Union. Flank Attack - Occurs when engaging a Union that is already Deadlocked with another Union. Damage dealt is increased for the offensive Union, and the defensive Union can not Attack or use Arts. Rear Assault - Occurs when engaging a Union that is already in Deadlock with another Union and flanked by two other Unions. Damage dealt is increased for the offensive Union, and the and the defensive Union can not Attack or use Arts. Interference - Occurs when forcing Deadlock on an enemy Union that was targeting another ally Union. Interception - Occurs when the enemy forces Deadlock on a player Union that was targeting another enemy Union. Massive Strike - Occurs when engaging a Union that is already in Deadlock with another Union, flanked by two other Unions, and in Rear Assault by another Union. Damage dealt is massively increased for the offensive Union. Multi-Deadlock - Occurs in place of a Flank Attack when attacking some boss Unions. It allows them to have regular Deadlock with more than one Union and does not prevent Attacks, Arts, or add any damage bonus to either Union. Timed button presses are an important feature of the game. They offer the ability to sometimes counter-attack should a unit dodge an incoming attack, as well as the ability to deal extra damage and bump up allied units in the turn order. The required button could be either A, B, X, Y, or the Right Trigger (Xbox 360 version) as well as being timed differently each time they occur. A circle shrinks around a graphic of the button to be pressed, and the player must press that button when the circle is lined up and scaled to the graphic. This feature can be turned off in the options. The Last Remnant's North American release was met with mediocre reviews and a tidal wave of complaints centered around the game's graphical performance. The use of Unreal Engine 3 led to serious performance issues and the original release was plagued by slowdown and poor frame rates. The PC release of the game in early 2009 was received with much more enthusiasm and solves many of the performance issues that came with the 360 release. New game plus mode that carries over many of the player's acquired collectibles and offers a Hard Mode to seasoned players. New formations, items, and the ability to preview the visual appearance of items before purchasing or creating them. No leader limit, new classes and far more customizable leader units. Slight changes to existing quests and DLC content. Autosave feature and more opportunities to save in important areas. Windows® XP Professional x64 Edition and server-related OS are not supported. 32-bit/64-bit are supported for Windows Vista®. Laptop versions and onboard video are not supported. Video cards that share the same VRAM as the main memory are not supported. The version used is DirectX® 9.0c.